Taking Wing Above The Garden - Kimono Series is a mixed media by Susan Maxwell Schmidt which was uploaded on February 18th, 2017. 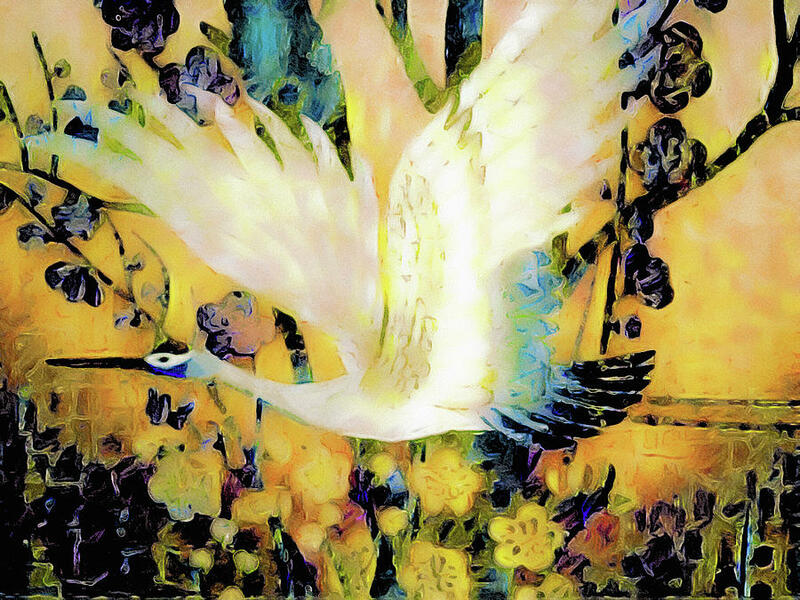 "Taking Wing Above the Garden"
A digitally painted photograph of the embroidered artwork on one of my vintage silk uchikake (wedding) kimonos, featuring a white crane flying above a Japanese garden with flowers and plum blossoms. My palette is comprised of mainly yellow, aqua, green and cobalt blue. Part of my Kimono Series. Please visit my Asian Art gallery to see all the pieces in the collection. Congratulations! This artwork was featured in Art In Motion Group in November 2017! I am back Susan ... this is so nice ! It sure has this oriental japanese touch ! Beautiful !!! CONGRATULATIONS, Susan! You are the Featured Artist for three weeks in the fine art group, Our World Gallery! Your work is consistently beautiful and masterful! v/f/feature and fb promotion! Susan...Your outstanding photo painting,has been selected as a weekly page feature in the 'Awesome Asia' group..Congratulations..Ian (admin)..20/Feb/2017.